The Crowne Plaza Copenhagen is located near a variety of other hotels in Copenhagen as well as a variety of attractions. Parken and Amalienborg Palace are only five minutes from the hotel. Other nearby attractions includes the Royal Danish Theatre and Copenhagen Opera House. There are also many restaurants, shops and entertainment options not far away from the hotel. Copenhagen Airport is only five minutes from the Crowne Plaza Towers Copenhagen. The underground station is just 150 meters from the hotel, making it easy to get around and reach the hotel. The hotel offers complimentary airport transfers. 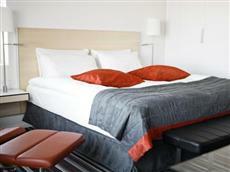 There are 366 guestrooms at the Crowne Plaza Towers Copenhagen as well as 4 suites. Each of the units is equipped with a flat screen TV, air conditioning, hair dryer and mini-bar. Guests of the Crowne Plaza Towers Copenhagen will be able to enjoy such amenities as Internet access, a lounge bar, meeting rooms, fitness center, 24 hour room service, on site restaurant, dry cleaning services and laundry services for the convenience of guests during their stay.